Manny was born and raised in the South Bay Area in the small city of Morgan Hill, California. He is the son of immigrant parents from Michoacán and Zacatecas Mexico. He is also the first in his family to attend college, earning both a B.A. in Urban Studies and Planning from the University of California San Diego and a Master’s in Public Health from the University of Michigan. 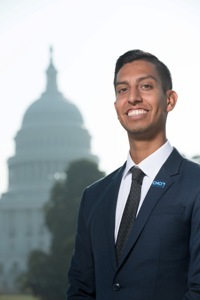 Manny is passionate about building healthy communities and creating equitable policies that support the well-being of underserved and underrepresented communities. At the University of Michigan School of Public Health, Manny engaged in research with a community-based participatory collaborative, Community Action to Promote Healthy Environments, where he worked on several efforts to reduce air pollution in Detroit. He published a public health action plan, led policy advocacy trainings, and developed materials to support health impact assessment projects. He also led the Latinx organization, La Salud, as the Vice President where he fundraised and implemented a week-long event titled “Celebrating Cultural Resistance” to demonstrate the vibrancy and power that communities of color have long possessed. Manny will continue to pursue opportunities that address racial health disparities and that enhance his leadership skills. As a CHCI Preventive Health Graduate Fellow, he hopes to better understand how to bring together traditional health organizations as well as private and public institutions to model a “Health in all Policies” framework to address the social determinants of health.